Accueil > Actualité du genre > Publications > Modern & Contemporary France, "Maghrebi-French Sexualities"
Modern & Contemporary France, "Maghrebi-French Sexualities"
volume 21, Issue 2, 2013, 140 euros. 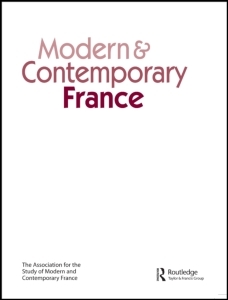 This special issue of Modern & Contemporary France focuses on Maghrebi-French cultures and sexualities in contemporary France. It began as a series of papers presented as part of the conference panel ‘Intimate Sexual Spaces in Maghrebi-French Cultures’ at the Twentieth- and Twenty-first Century French and Francophone Studies International Colloquium hosted by the University of Guelph (Canada) in 2010. Subsequent discussions and collaborations have now given rise to the following collection of essays that aim to ‘decline’ (Rosello 1998) several stereotypes related to the sexualities of Maghrebi-French men and women who live their lives at the crossroads of different cultural, religious, and ideological traditions. By using sexuality through the analytical lenses of feminist, queer, post-colonial and political-economic theories, among others, we aim to expose the largely heteronormative nature of the ‘sexually democratic’ (Fassin and Surkis 2010) or ‘modern’ French state and its anti-immigration policies that go hand in hand with the policing of ‘archaic’ sexualities. By focusing on French citizens of North African descent, we draw attention to issues that are of particular importance to these post-colonial communities. Nevertheless, the politics of the state and the policing of sexualities in a ‘secular republic’ have consequences for all French citizens regardless of their cultural, religious, linguistic, or other background.